More on the passing of Jane Loeau, 1873. At 11:30 in midday, on this past Wednesday, July 30th, Mrs. Jane Loeau Kaelemakule died, one of the royal descendants, at Puiwa, Nuuanu, at perhaps 27 years old. In the evening of this past Thursday, her body was taken and buried at the cemetery of Kawaiahao. 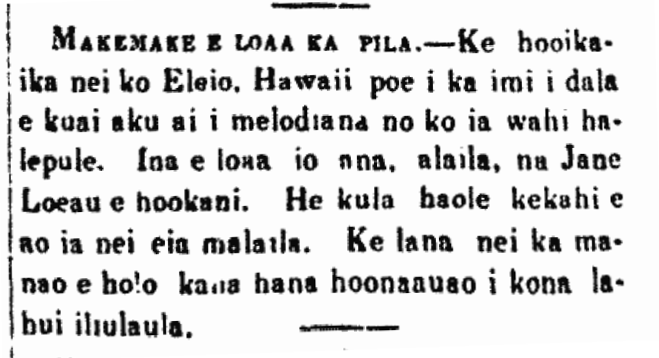 Ka Nupepa Kuokoa, Buke XII, Helu 31, Aoao 2. Augate 2, 1873. More on Jane Loeau, 1867. Ka Nupepa Kuokoa, Buke VI, Helu 2, Aoao 2. Ianuari 12, 1867. Jane Loeau, daughter of Liliha, daughter of Loeau, daughter of Kalani, and son of Kamehameha Nui, being the sixth from Keawe, the seventy-sixth from Wakea, and the one hundred and fifth from Kane and Kanaloa. And now oh God, let her rest in peace. Amen. Nuhou, Volume II, Number 9, Page 3. August 12, 1873.